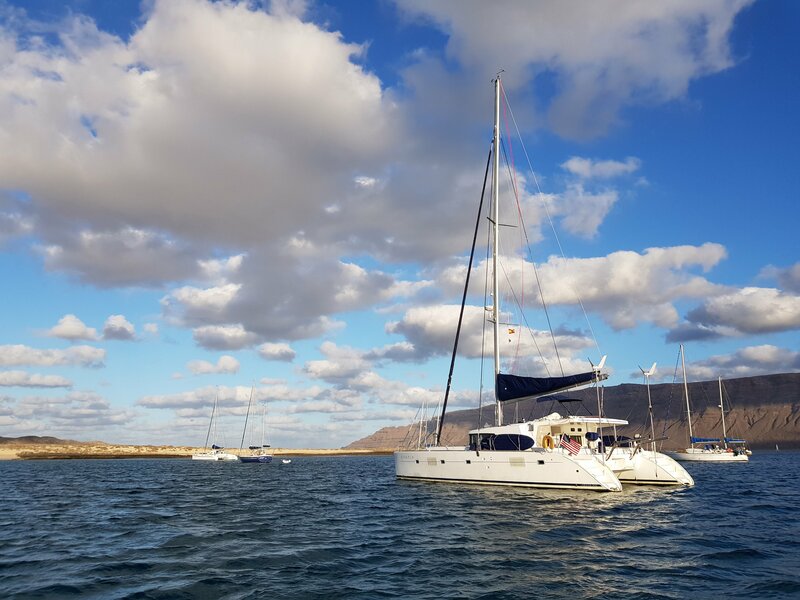 Here are the daily updates Jenna wrote during our recent Atlantic crossing from Las Palmas in the Canary Islands to Port Saint Charles in Barbados. I will be following up with a post discussing what worked and what broke during the trip. We sailed over 2700 miles in 16 days, 7 hours. We averaged 7 knots. We only used our motors for spinnaker changes and to investigate a weak AIS signal we received in the middle of the Atlantic. We sailed straight downwind for over for 2,000 miles with no mainsail, relying on either the jib, parasailor, or spinnaker the entire time for downwind running. We caught 5 fish and had a wonderful time. Our position at noon UTC +0:00 is 26°14’.158N 16°51’.474, having motorsailed through a wind shadow at the south end of Gran Canaria and sailed 143 nm in just over 20 hours. We are currently on a beam reach with three reefs in the main and a reefed jib in 20-30 knot winds in 2.5m beam seas, going 7-10 knots. This is not our favorite sea state, so we’ve adjusted course south of the rhumb line to stay a little more comfortable until the wind shifts around and we can avoid bashing into the waves. Sophie feels very solid. Richy cooked a fabulous spaghetti dinner last night and all except the kids did night watches under an almost full moon and beautiful stars. Today the guys spotted a sea turtle and a bird. We’re all catching up on sleep and adjusting to our sea legs. The weather forecast calls for the wind to shift more northeast over the next day, making our ride more comfortable and giving us a better angle for Barbados. Our position at UTC +0:00 is 24°34’.548 N, 19°12’.796 W. Current VMG 7-9 knots. We made 163 nm in 24 hours and have less than 2400 remaining to Barbados. Sophie is now west of Africa! We have passed another continent. Almost two years ago was our last day east of Africa, where celebrated Hazel’s 8th birthday offshore between Somalia and Yemen as we entered the Gulf of Aden on our way to Egypt, over 4,000 nm east of our current position. The past 24 hours have brought higher seas, but as predicted the wind slowly shifted direction overnight, giving us a better angle. We just switched to our parasailor, which makes our ride much more comfortable and is perfect for going directly downwind. Last night Jamie cooked a fabulous dinner of ratatouille with sous vide chicken and rice. Richy served up bacon and vegetable scrambled eggs with toast for breakfast. Later in the morning, a superpod of dolphins joined us and put on a spectacular hourlong show in the sunshine. And we finally put two fishing lines in the water. Life is good. Our position at +0:00 UTC is 23°25’.637 N, 21°32’.085 W. We traveled 145 nm in 24 hours. Current VMG is ~7 knots. We’ve had an eventful day. A few hours after raising the parasailor, an AIS position alarm went off, followed by a keyboard disconnected system failure. When we tried to reset we had further Raymarine issues, so Jamie proceeded to troubleshoot while I hand steered without instruments for a couple hours. (We have backup Navionics on phones and iPad.) We hand steered until just before sunset, as Jamie discovered at least four faults and we kept blowing fuses as soon as he replaced them. He succeeded getting the autopilot, chart plotter, AIS, keyboard, and radar running in the flybridge, so we dropped the parasailor and unfurled the jib for the night. This slowed us down, but we felt this was the safest option without wind speed instruments. Sophie sailed relatively fast through the night, and I ended up reefing the jib around 10pm when a small squall blew through that pushed boat speed up to 10 knots. Sophie ranged from 5-7 knots for the rest of the night. This morning Jamie isolated the main problem to a faulty SeaTalk ng 5-Way Connector. Luckily we carry a spare so after replacing it, everything is working again except for the keyboard for the downstairs nav station (which we can easily live without). We assume all of these issues were caused by the first couple days of rough seas we encountered since all systems functioned normally for the first 48 hours of our voyage. The parasailor is back up for the day, and we are cruising along at 7-8 knots in bright sunshine. Kids are back to Sophie School, and we’re all having fun. Our biggest news of the morning is that Richy carved off the first slices of the Iberian ham leg so we are now taking bets on how long this 10kg will take us to eat. No one expects it to last until Barbados. Sous vide pork tenderloin is planned for tonight’s dinner menu. We’re still figuring out side vegetables. Our position at noon UTC +0:00 is 22°31’.905 N, 24°18’.939 W. We traveled 166nm in 24 hours. VMG ~7.5 knots. We’re averaging more than 7 knots during the day, and slower at night. The wind has settled into more consistent ENE over the last day so we have been able to make progress on the rhumb line to Barbados. We flew the parasailor into the night, but took it down around 10pm after the wind picked up and a few squalls blew through. Richy ended up with some rope burn during the sail change so we ran some drills to practice taking the chute down and hone this process to under 3 minutes in 20+ knot winds so now everyone feels more comfortable with it. Today is another beautiful sunny day that started with rainbows and raising the parasailor again. The waves are under 3m and mostly following seas now, with rollers coming from the north so our ride is more comfortable with each passing day. Hazel and Kate cooked magnificent apple pancakes with maple syrup and weißwurst for breakfast. The kids continue working hard at Sophie school. And we’re looking forward to Mexican night for dinner. We’re also two days into the Iberico ham and loving every bite. We feel so fortunate to have such a fabulous crew together for this crossing. Our position at noon UTC +0:00 is 22°03.826’ N, 27°10.957’ W. That’s 161nm in the past 24 uneventful hours. We had a quiet night with full jib and put the parasailor up again just after dawn. A large pod of dolphins visited us before our breakfast of Spanish tortilla – one with onion and potatoes, one with spinach and potatoes. Jessica also taught Hazel how to play Skull King this morning, and it is quickly becoming an essential Sophie game. Hazel wants to bake raspberry muffins after school and Katie is planning Thai fish curry for dinner using some of the mahi mahi we caught in the Med. We still have two lines in the water, but no new fish yet. Thanks for all the love notes! We love hearing from you. Our noon UTC+0:00 position is 21°44.390’ N, 30°12.478’ W. Sophie covered 170nm in 24 hours, averaging just over 7 knots. We ran with a full jib overnight and raised the parasailor just before breakfast again. The team is really working well together and our process continues to improve with each sail change. Sea conditions are also better than our first few days. Everyone is comfortable and has their sea legs now. Confused seas continue to slow down our progress a little, but we notice a significant speed increase whenever we pass through a stretch of calmer water or waves come from only one direction. Katie’s Thai fish curry was an outstanding dinner last night. She is spoiling us with so many wonderful recipes this trip. Hazel organized an early morning muffin baking party and convinced (tricked?) Jessica to wake up at 6:20am to get started on raspberry, apple, chocolate, and chocolate-raspberry muffins. They were delicious! Kate also cooked up fried eggs with tomatoes, cheese and avocado on toast for our hungry crew. Less than 1,800 miles to go! Life is good. Our position at noon UTC +0:00 is 20°56’.086 N, 33°03’.771 W, another 167nm in 24 hours. Richy’s fingers continue to improve. There is no sign of infection, no oozing of any kind. His skin has sealed nicely. He’s airing out his hands for a few hours each day, and while bandaged he is able to do almost everything, although we’re keeping him off sail wrangling, rope handling duties and cleaning dishes, etc. so he stays protected and dry. This morning, Richy cooked us omelettes for breakfast, and he’s spending most of the day driving the boat while playing dj and entertaining us from the flybridge. Last night was another uneventful starry night. We ate bacon, leek and cheese quiche for dinner after swapping from the parasailor to full jib for the night. With wind and waves behind us, we’re just following the rhumb line. This morning Jasmin, Kate, Jessica and Leo helped Jamie raise the parasailor at sunrise. The wind and waves have picked up a little more today, and we are zooming right along. Our position at noon UTC +0:00 is 20°01’.913 N, 36°57’.694 W. We traveled 172 nm in 24 hours with an average speed of 7.166 knots. The wind has picked up to 20-25 knots with stronger gusts so this morning we opted to leave the jib up for the day. Jessica introduced us to the wind angle setting on our autopilot so we are steering to a wind angle of 179° to port today. How have we not tried this before!? It’s a very smooth ride and we look forward to using it with the parasailer tomorrow. Jasmin cooked spaghetti aglio olio for dinner last night, and everyone is enjoying a later start this morning since we didn’t have a sail change at sunrise. With the jib up we can also have more fishing lines in the water. We are closing in on the halfway mark for our crossing, with plans to celebrate tonight with sous vide tenderloin steaks, mashed potatoes and stir fried leeks. Richy’s fingers continue to improve. He’s keeping bandages off more during the day and even collected a flying fish that landed on the trampoline this morning with bare hands 😉 We have two poles and two hand lines in the water so hopefully more fish will follow. We’re halfway there! Barbados is now closer than Gran Canaria. Our position at noon UTC +0:00 is 19°03’.740 N, 38°40’.853 W. That’s another 164 nm in 24 hours. To celebrate, we feasted on steak, mashed potatoes, stir fried leeks, and lemon soda, with homemade apple pie for dessert. And the Patriots won! Hazel was up bright and early this morning to prepare French toast for breakfast with help from Katie and Uncle Richy. We sailed with the jib all day yesterday and overnight. It felt like taking a vacation day without any sail changes and with the autopilot steering by the wind. We raised the parasailor again early this morning. It’s a bit squirrelly right now with occasional +25 knot gusts in 2-3m swells, but the wind forecast calls for more moderate 15-20 knot easterlies this afternoon which should smooth out our ride. Richy is planning to make a veggie lasagna for dinner. Overall, our fresh vegetable provisions have done well on this crossing. We have a few remaining eggplants and squash that need to be eaten soon and will go into tonight’s lasagna. We still have fresh green beans, cabbage, red peppers, carrots, tomatoes, cucumbers, potatoes and onions, plus bananas, melon, pineapple, oranges and apples for this week. We also have a few bags of green veggies and a variety of berries in the freezer. Jessica is guest teaching Sophie School today for Hazel, who of course is on her best behavior. Leo is also making progress on his offshore assignments for his new school. We had some excitement in the middle of the night. Just before 1am, a 35-knot rain squall blew through, completely drenching Kate and Jessica near the end of their watch. Right afterwards, they smelled something that resembled burned plastic, so they woke up Jamie and began hunting for the source. I joined the search, and Richy and Jasmin were also up getting ready to begin their night watch. After we narrowed down the location to the genset compartment, Jamie ultimately discovered that our 10-year old Proficient Audio amp had burned out. Over the course of the trip, it had been splashed by water coming up through an air vent. Jamie also removed an old outlet that we never use that showed signs of corrosion. There is some more cleanup to do today to rewire outlets under the nav station and inside the computer cabinet that Jamie disconnected as part of the triage. Aside from this, all systems are working. This morning marks another milestone. We’ve traveled the same distance and days traveled from Gran Canaria as our crossing from Thailand to the Maldives with Richy and Katie a couple years ago. We’ve gotten into a good offshore rhythm on this passage now for day and night watches, meals, school, and music. The Sophie offshore feast continues. Richy cooked “vegetable” lasagna with more bacon and bechamel than veggies last night. This morning, Hazel made everyone coffee and mixed waffle batter for our waffle and weißwurst breakfast extravaganza. Katie has dubbed me the Waffle Angel since I manned the waffle iron today and served up hot, crispy deliciousness. We are debating which of our other sausages to cook later today and also whether to repeat Quiche Lorraine or make crepes next. Decisions, decisions. The sun feels hotter each morning and we have bright blue skies with puffy clouds in the distance. We can feel a shift towards the tropics even though we still have a ways to go. Life is good. Our position at noon UTC +0:00 is 17°35’.691 N, 44°26’.979 W. We traveled 173 NM, our fastest day of the crossing so far. The weather cooperated so we flew the parasailor nonstop for the past 24 hours and may leave it up for a few days straight now given the weather forecast. Less than 1,000 miles to go! Fish!Fish!Fish! By far the most important event of yesterday is the 5 kg mahi mahi we caught. Jamie had rigged an alarm for the hand line using an empty can and it worked perfectly. Leo, Kate and Jessica worked together to pull in the line and Jamie gaffed the fish. We are looking forward to grilled mahi mahi for lunch today. We’re feeling the tropics approaching as the temperature and humidity increase each day. Sunblock and hats are out and we’re starting to hide from the sun during the heat of midday. Air temperature 23°C. Water temperature 26°C. Wow, have we missed this! We ate a spectacular German dinner of Nuernbergerwurst, potato salad and sauerkraut, and we’ll make roasted pepper, bacon and goat cheese quiche for tonight’s dinner as a follow on to our fish feast midday. We’re starting to feel the pressure of only a handful of days remaining on the crossing. There are so many more dishes we want to prepare before we arrive. Maybe we’ll need to move to four meals a day so everyone can cook their favorites this week. Last night on watch Kate and Jessica had some excitement. A flying fish landed on the roof of the main cabin that sounded like “whispering elves wings,” according to Jessica, as it bounced around on the deck. Kate saved flying fish Pete, as he has been affectionately named, just in time. He gave her a little wink in thanks before swimming off. We hope you are enjoying your week as much as we are. Our position at noon UTC +0:00 is 17°08’.591 N, 46°47’.217 W. In 24 hours we moved 145 NM. Yesterday and overnight we flew the parasailor, but given the light winds forecasted, this morning we switched to to spinnaker. We assume we will go about a knot faster in light air with the full spinnaker. The next couple days offer an opportunity for us to do some head to head comparisons of our downwind sails. We had an exciting adventure yesterday afternoon. Richy, Kate and I were in the flybridge when we picked up a weak AIS signal about 3.5 NM from Sophie. We couldn’t see a boat with the naked eye or through binoculars, which we thought was odd given the close range. The AIS screen showed the signal moving at .9 knots with the wind, but then the AIS signal dropped out after a few seconds. Jamie came up and we tried hailing on VHF with no answer, so he quickly decided we should drop the sail and motor towards the location just in case the signal was coming from a boat in distress, liferaft or someone in the water. We motored into 20 knot winds in the approximate direction of where we thought it would drift and eventually spotted a tiny boat that flashed us with a mirror as we got closer. We were quite relieved to discover a French offshore rowboat with two gentlemen on board, Philippe and Gilles, who are rowing across the Atlantic. We talked via VHF and learned that they are 58 and 60, and one of them has Parkinson’s Disease. They are rowing across the Atlantic to raise awareness that is possible to do almost anything with Parkinson’s when you keep your body strong. Their website is http://quinquatlantic.fr They departed the Canary Islands on December 15 and expect it will take another 20 days for them to reach Martinique. We feel very fast by comparison and quite fortunate to have met up with them 900 miles from Barbados. They are the first boat we’ve seen in more than 10 days. Unfortunately, when we were within hailing distance of the rowboat, we experienced an error on our engine shifter. This is a problem we first encountered in Madeira when the engine mounts failed. The cable between the ZF controller and the sail drive is still a little bent causing too much resistance and a subsequent error message. It’s an easy adjustment and 20 minutes later we were sailing again with the parasailor past the rowboat, snapping many pictures of each other. We can’t wait to swap pictures with them after they arrive to Martinique. We had a fabulous grilled lemon mahi mahi feast with rice and ginger stir fried vegetables for lunch yesterday, followed by roasted pepper, bacon and goat cheese quiche for dinner. Jasmin has spoiled us again this morning with superb homemade kaiserschmarrn and apple mousse. Hazel took her first night watch with Uncle Richy last night, and continues to grow more interested in learning to drive Sophie. She has also enlisted Jessica and Kate as guest teachers for most of her school subjects. They are doing a fabulous job teaching and I’m not really sure what to do with all of my new free time. Life is good in the Atlantic. Our position at noon UTC +0:00 is 16°19’.272 N, 49°44’.808 W. We traveled 169 NM in 24 hours flying the full spinnaker. 600 miles left to Barbados. Leo and Hazel have a new cousin!!! Olivia Rogers, 7 lbs. 4 oz. was born at 2:31 EST January 18, 2018. Please join us in congratulating my sister Julie and her husband Silas on their beautiful girl. Welcome, Olivia! We love you so much and can’t wait to meet you in person. Yesterday was a good day for fish. We caught a 3.6 kg wahoo on the fishing pole. Richy, Kate, Jessica and I doused the spinnaker and lowered it to slow the boat so Jamie could reel in the wahoo. Grilled wahoo and artichoke risotto are next on the menu. Unfortunately we lost a big mahi mahi that was on one of the hand-lines at the same time the wahoo hit. Later in the afternoon, Leo and Hazel spotted another fish on the line while I was sleeping. For the first time ever, Leo reeled in, cleaned, seasoned and baked the fish all by himself as a surprise appetizer for dinner. We don’t know exactly what type of fish it was. Maybe a type of trevaly? Regardless, Leo is very proud of his accomplishment and the fish was tender and delicious. Richy and Kate made stromboli roulades for dinner – stuffed rolled pizzas with a mix of salami, ham, cheese, tomato, roasted peppers and olives. To celebrate crossing the 2,000 mile mark of the passage, we watched the movie Battleship (because Rihanna) on the big screen. Who doesn’t love Rihanna? Hazel and Leo did their evening watch with Uncle Richy, which includes quizzes on the electronics, and then we enjoyed a starry and calm night. We hope you all have a wonderful day. Our position at noon UTC +0:00 is 15°35’.688 N, 52°19’.492 W. We traveled 155 NM in 24 hours, continuing to fly the full spinnaker day and night for 48 hours straight. We are 450 miles from Barbados. Happy birthday, Stephen! We love you and hope you had a wonderful day. Double take down! Leo and Kate executed a cousin double mahi mahi takedown on the hand lines. Each fish weighed 4 kg. Leo cleaned and fileted the mahi mahi under Jamie’s supervision. We vacuum sealed and froze all of it since we currently have a fresh fish backlog here on Sophie. For lunch we ate pineapple fried rice and grilled marinated wahoo. This is our first wahoo since Southeast Asia and we had forgotten just how much we love wahoo. For dinner we cleared out our containers and did a leftover smorgasbord of fish, quiche, pizza rolls, cheese, prosciutto and more. Things are getting pretty serious now that we only have a few days of passage cooking left and so many dishes we still want to make. Risotto, carbonara, pork tenderloin with apples and onions, homemade baguettes, chicken tikka masala… we will run out of time. Kate and Jessica treated Hazel to a special day of German style Sophie School, including a strict schedule, homework and sailing class with Uncle Richy. She had a blast. It’s a calm and relaxing ride as we tick off the miles and watch the waves. The boat systems are all working well. There is a lot of laughter on Sophie. Life is good. Our position at noon UTC +0:00 is 14°46’.685 N, 55°02’.761 W. We traveled 165 NM in 24 hours, continuing to fly the full spinnaker day and night for 72 hours straight. We are under 300 miles from Barbados. We’re in the home stretch now and counting down the miles as we calculate our average speed and factor in a weather forecast that calls for 15-22 knot winds and slightly higher waves over the next 24 hours. We will change sails at some point as the wind increases, but we aren’t sure yet when that will be and are thoroughly enjoying this spinnaker run for as long as it lasts. Yesterday Hazel renamed Friday Family Movie Night to Friday Family Film Festival. We kicked off with a girls night viewing of Mama Mia and even did face masks. Spa treatments may continue with pedicures before we arrive. We made artichoke risotto for dinner and had barbecued sous vide chicken with leftover rice for lunch. Fish tacos are planned for tonight. We’ve noticed that we’re running the generator more frequently on this passage than previous trips. There could be several reasons for this. Our autopilot could be drawing a lot more with the sensitivity set on high. Another possibility is that our refrigerators and freezer are working harder in the tropical heat. We are also charging more electronics than usual with 8 people on board. There is a significant amount of seaweed floating in the water here. This started a couple days ago and has grown denser during the last day. We believe patches of it extend for hundreds of miles and we can see it from horizon to horizon. We wonder whether it’s normal in this region, a remnant of hurricane season, or an impact of global warming. We ended up reeling in the fishing lines after repeatedly snagging plants all day yesterday and again this morning so we are on a fish break for now. Sunshine, blue skies and warm wind. We couldn’t ask for more. Our position at noon UTC +0:00 is 13°42’.969 N, 58°12’.302 W. We traveled 194 NM in 24 hours. It’s been a rocket sleigh ride overnight. We finally swapped sails yesterday evening after 81 hours flying the full spinnaker, our longest stretch ever, and put the parasailor back up. We’ve averaged 20+ knot winds overnight with gusts into the 30s and boat speed of 8-12 knots with multiple rain squalls. We are now just 91 miles from our anchorage in Barbados and expect to arrive this evening, give or take a few hours. Sophie is surfing down waves as short gusty rain squalls pass through the area today. It’s speedy, but not particularly comfortable. Nobody slept much in the rolly seas overnight. Hazel will complete her final day with Kate and Jessica as guest Sophie School teachers. She has loved every minute with them. We will cook pasta carbonara – comfort food – for our final passage meal, and we are all looking forward to rounding the northern point of Barbados, completing the passage, dropping the anchor and getting a full night’s sleep. Hello Barbados! Sophie has arrived. We just dropped anchor at 7:21pm local time at 13°15’.666 N, 59°38’.766 W after 95 miles since 8am local today. Overall, the passage took 16 days and 7 hours, and we averaged just over 7 knots. After a stormy morning, we had a beautiful warm sunny afternoon as we caught sight of land and approached over several hours. We flew the parasailor all day until we turned the corner at the north end of the island. A pod of dolphins welcomed us to Barbados with a spectacular jumping and flipping show — one of the best we have ever seen. After the dolphins left, we motored the final two miles as the last glimmer of twilight disappeared. It turns out we anchored right next to our friends on Ventus who just arrived earlier today. We’re so happy to be here, safe and sound. Now for some celebration and sleep. Thanks for following along with our journey. PS … Have we mentioned lately how lucky we are? PPS … Have we mentioned what a great crew we had for this passage? We are extraordinarily thankful for their help and company. 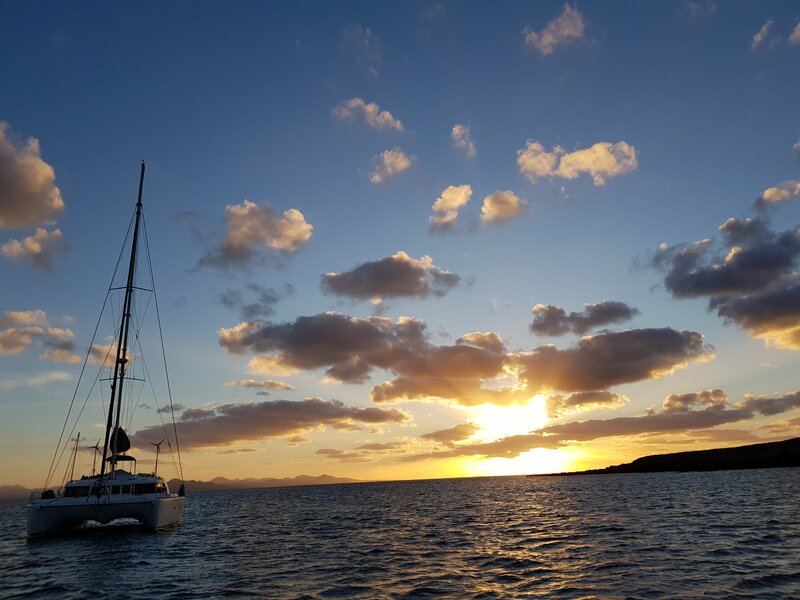 Greetings from our anchorage at Isla Graciosa in the Canary Islands! We have sailed 1,000 miles since our last update from Ibiza, with stops along the Spanish coast, Gibraltar, and Madeira on our way here. Sophie and her crew are very excited to be doing ocean passages again, and we think we will be ready for our big Atlantic crossing next month. Here is what’s going on with Sophie as we continue to get ready. 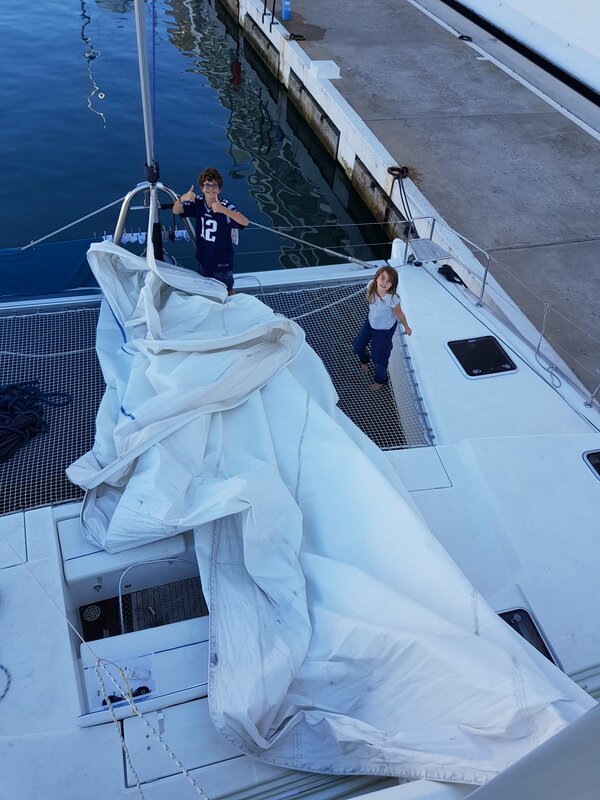 While we were in Gibraltar, we upgraded Sophie’s mainsail and genoa. 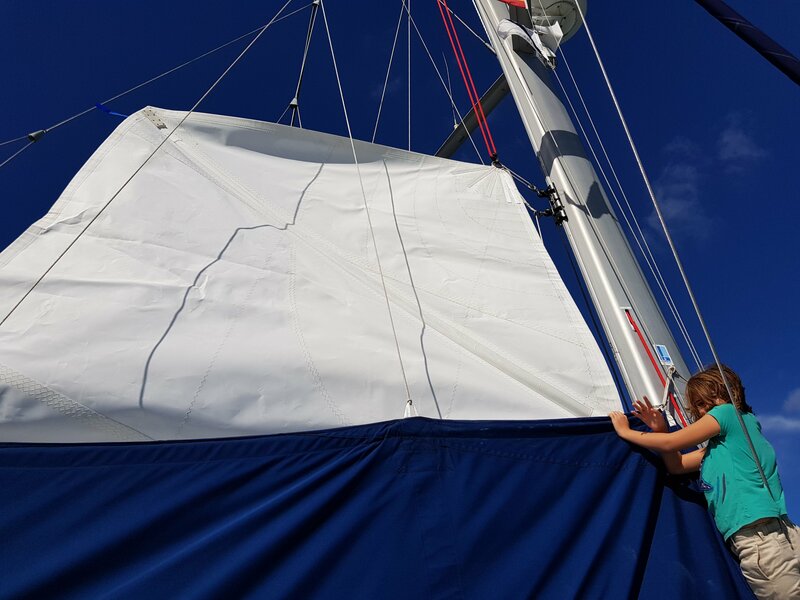 We think the new sails have added a knot of boat speed to Sophie, which is a big big deal for us. Our old main and genoa came with the boat when we bought her almost 10 years ago. They’ve served us well during this time, propelling us 3/4 of the way around the globe without any major tears. But over the years, these two babies became tired, baggy, and a little threadbare. Jenna and I were worried we would suffer a major blowout during our Atlantic crossing in January, so we decided earlier this year to replace them. After 10 years of service, these two sails had given us all they could give. Taking them off one last time was a family affair. Sophie’s sails are big suckers. The main alone is almost 1,000 square feet. For our new sails, we worked with Phil Auger from Zoom Sails in Malaysia. We met Phil when we were in Langkawi a couple of years ago, and we are extremely happy with his work. He designed a new square-topped mainsail for us as a replacement for our big roach original main, and he did so in a way that enabled us to use our existing battcars and 5 of our 6 original battens. The new main weighed 80 kilos and arrived in a box bigger than Hazel! Phil used the same approach Lagoon uses for the top of the square-topped mainsails, with a length of Dyneema rope running through two ring bolts on the top battcar. This enables the sail to lie flat while in the bag and snug to the mast when raised, regardless of the reef. The result is a great shape with more power. The new main has three reef points, just like the old one. We replaced the reef blocks and reef lines, and on our 270 mile run from Madeira to the Canaries we reefed multiple times with ease. There is much less friction than before. The new genoa is the same basic size and shape as the original one. We opted to forgo the window this time because the old one kept tearing. We also went with a blue Sunbrella UV strip that matches the blue of the mainsail bag and bimini. All in all we are very happy with this work. 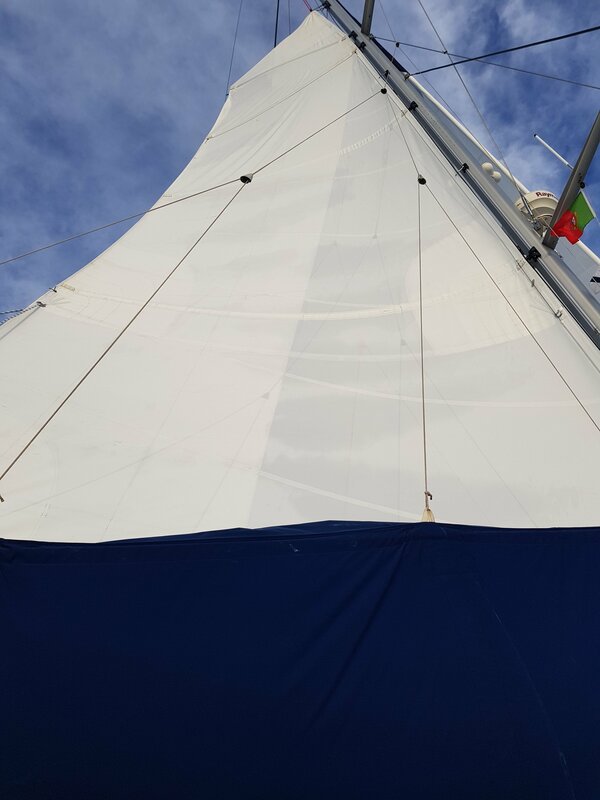 Both sails are made from high UV resistant dacron. They feel stiffer and stronger. Phil was able to do all of the design work remotely, and he was very responsive throughout the entire process. We are happy customers. So why do we think we are a knot faster? It’s mostly a gut feeling based on multiple moments on our Madeira-Canaries run this week. When we departed the Quinto Do Lorde Marina 3 days ago, we were immediately hit with 25-30 knot winds directly on the beam along with steep 2 meter seas. With 2 reefs in the main and 1/3 of the jib rolled in, we sailed at 9-10 knots. Later on that day with 15 knots of apparent wind on the beam with 1 reef in the main and a full jib, we sailed at 8 knots. A day later with 10 knots apparent wind @ 70° with full main and jib, we sailed at 7 knots. This all felt faster to me and Jenna and reminded us of how Sophie sailed when we first bought her. The sagginess of Sophie’s old sails clearly affected her performance. Sophie’s sailplan is based on a very large mainsail and a smallish foretriangle for the genoa. Newer Lagoons use a more balanced design where the mast is located farther aft, reducing the relative size of the main compared to the foresails. I think the square-topped main adds more power to Sophie, especially when reefed. Since Jenna and I reef much more frequently than we did when we bought the boat, this added power actually translates to more speed with greater stability and safety in winds greater than 15 knots because that is when we start reefing. Our exit from Gibraltar provided us with the perfect opportunity to test the new chute, and again Jenna and I were very happy with the results. The wind blew 20-30 knots in the Strait as Sophie sailed dead downwind into the Atlantic at 8-9 knots. With our big chute, these winds would give us white knuckles and heart palpitations while we constantly worry about when we should take it down. The new chute felt stable and controlled in this situation. It didn’t jerk around in gusts, and the foil provided lift to Sophie’s bows, giving us a bit of a surfing feel. The wind died down after the first 50 miles, and we decided to leave the new spinnaker up overnight. This is the first time we’ve done this without additional crew on board. This sail is a great new option for us and will hopefully cut a day or two off our Atlantic crossing time next month. By the time we reached Gibraltar, it had been 18 months since Sophie had sailed in the open ocean. Jenna and I wanted to make sure that the boat was once-again passage-ready, so we went through our usual series of pre-crossing checks. For starters, we had local riggers Sean and James inspect our mast and rigging. They believed that our rig was tuned too tightly, resulting in some extra bend in the mast. They also discovered that some of the bolts that hold the mast to its supporting compression post in the cabin had come loose. Yikes! There were no signs of cracks, water leaks, or structural damage in the area. We also contacted Lagoon, and they did not indicate it was a problem. So we tightened the bolts and re-tuned the rig with less mast bend. 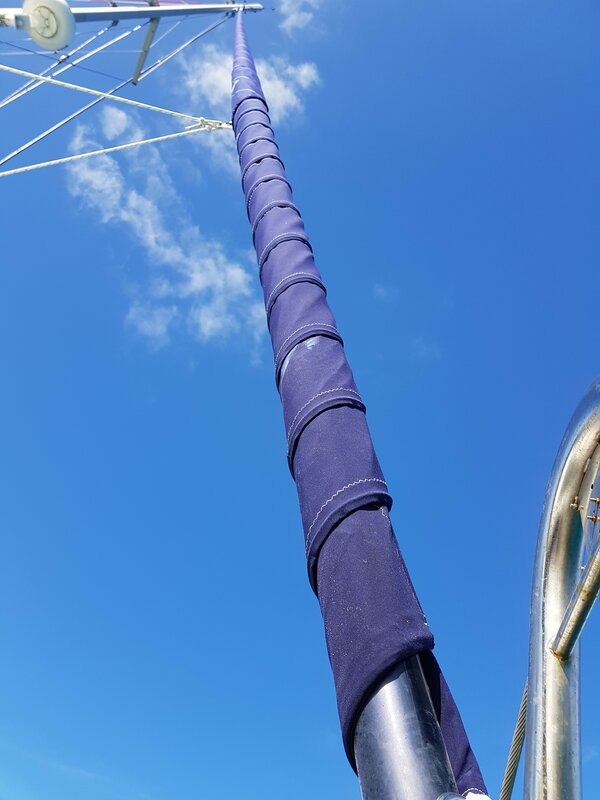 Sean and James also discovered that one of our diamond stays – the steel cables that hold the mast in column – was showing signs of deterioration so they replaced it. They also machined some new bearings for the gooseneck on the boom. It now wiggles a lot less. 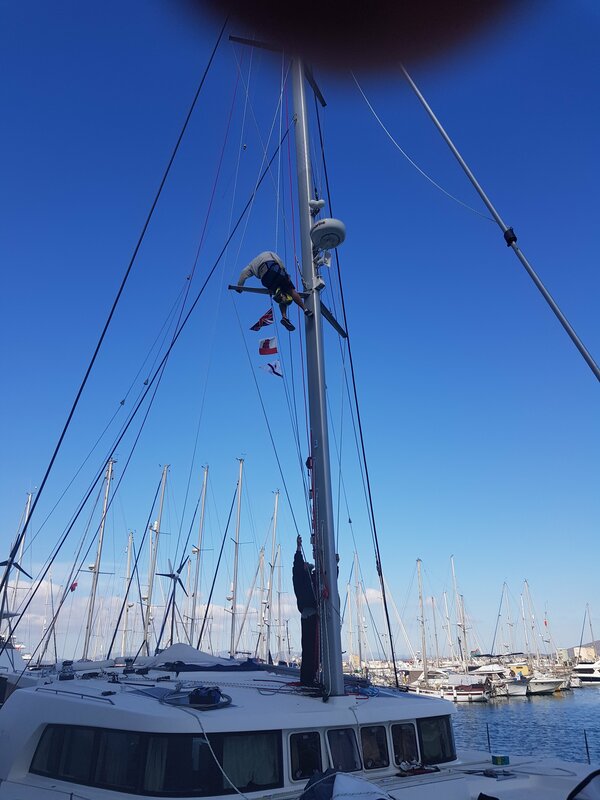 We replaced all of our running rigging – the ropes that we use as sheets, halyards, reef lines, guys, and traveller controls. We had some of these custom-made in England. Finally – and one could argue most importantly – we had our liferaft inspected and recertified. It still looks brand new. Hope we never use it! While we were in Gibraltar, we were able to carve out the time to for a 2-day visit to Cordoba and Seville. Other than that, we worked 10 hour-days getting Sophie ready for the Atlantic. Just getting the new sails off and on took 3 days! We were so busy we didn’t even have time to climb The Rock, tour the tunnels, or see the monkeys. That’s really sad, so we will have to come back. We enjoyed an uneventful 600 mile/4 day run in the Atlantic Ocean from Gibraltar to Madeira. 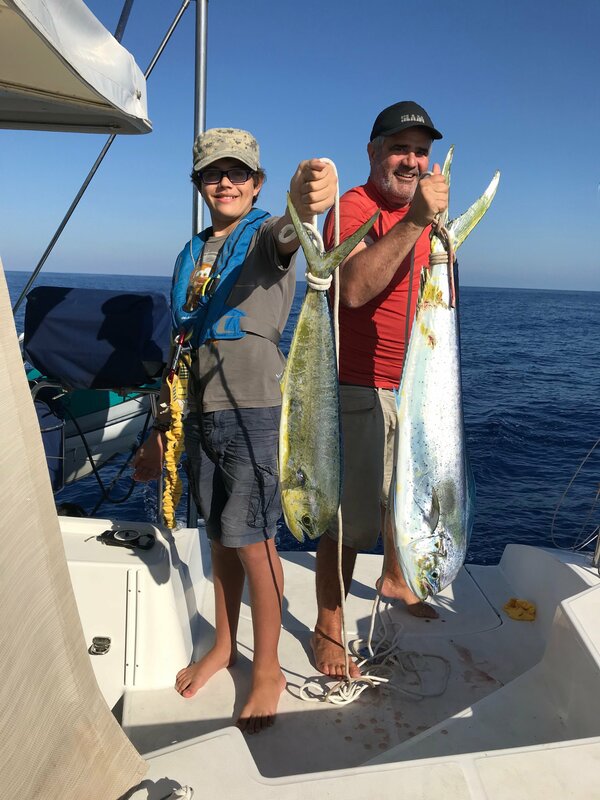 Other than the downwind sleigh ride in the Strait of Gibraltar, the highlight of this passage was a “double takedown” of two mahi mahi at the same time. It was a funny catch. Leo was at the wheel when a fish hit our lighter pole. He stopped the boat, yelled FISH FISH FISH, and started reeling her in. I was below taking a nap and came up to reel in the line on our other pole. We do this so the lines don’t become tangled. I soon realized that I had a fish on my line as well. Leo’s fish was 4 pounds, and mine weighed 22 pounds. Ha! They both tasted delicious. Leo is certainly getting big, isn’t he? 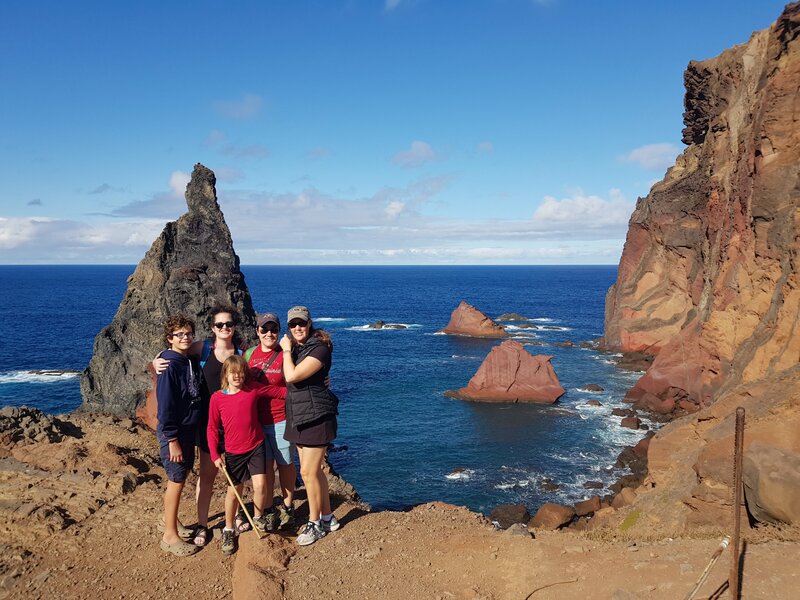 We chose Madeira because my daughter Sara and her wife Julie had planned a big reunion there for November. Julie’s father grew up in Madeira, and we had 8 people from the US fly in to join 20 cousins, aunts, and uncles who live in Madeira for two weeks of family meals and celebrations. We had an absolutely wonderful visit which we will hope to cover in another blog post. So why the thunk thunk thunk? Well, as part of the two week reunion we invited 25 souls to come join us for an outing on Sophie. It was a calm and sunny day, and we thought we’d go out for a bit of a sail, throw a couple of lines in the water, and maybe catch us some fish. So once we had everyone on board, I fired up the engines and heard a loud, crumbly Thunk Thunk Thunk noise from the starboard side. It didn’t sound right at all, so I killed the engines and went outside to see if a neighbour on a powerboat had started his loud, poorly-tuned diesel at the exact moment as I did. Nope. So I tried one more time and heard the exact same noise. I quickly killed the engine, went to examine it and found it was askew by 5 degrees. I knew immediately that it had jumped it’s mounts, the steel and rubber “feet” that connect a diesel engine to the hull of a boat. Brand new engine mounts look like this. Sophie’s starboard engine mounts on the afternoon of the party looked like this. Believe it or not, it was a relatively easy repair. Jenna was heading to the States for a few days to attend her sister Julie’s baby shower, and we made sure she returned with four new engine mounts. The local Yanmar dealer sent a couple of guys over – one of them was a big fella – and they simply used a lever to lift the engine up a few inches to get enough space to swap out the mounts. There was no damage to the sail drives or hulls. 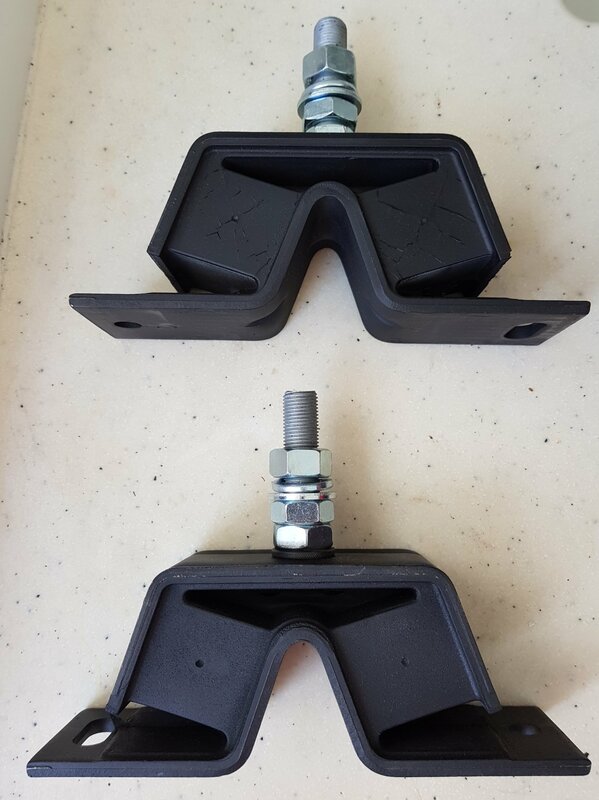 All four of the old mounts looked like this. Needless to say, we were ridiculously lucky that this happened to us while on a dock. 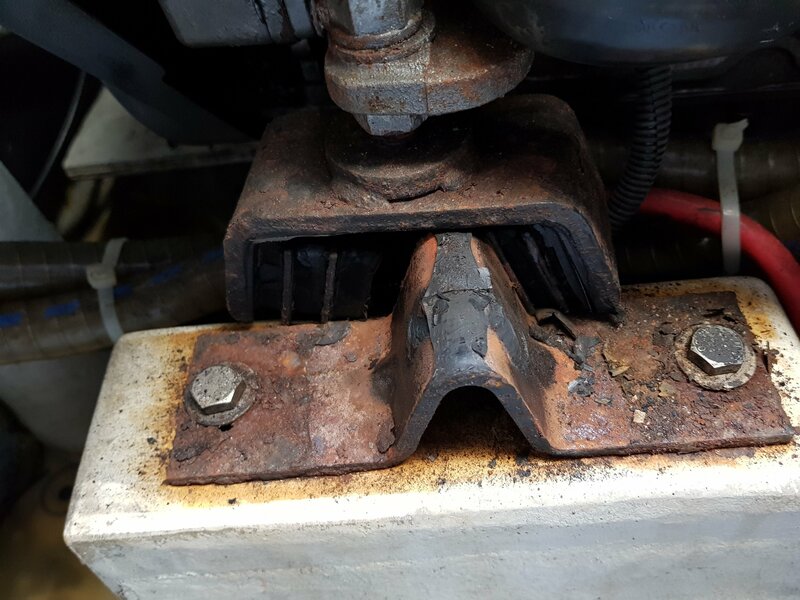 The mounts had slowly rusted during the last 10 years, and at our dock in Madeira there was a strong, sharp sideways surge that, over the course of a week, slowly nudged that engine off it’s mount. The mounts on the port engine were also completely shot, but that engine hadn’t moved. If this failure had occurred at sea in rough weather, we could have experienced some significant damage. The good news is that our afternoon outing on Sophie was still a complete success! I took everyone out for dinghy rides; people enjoyed the marina’s salt water swimming pool; and we even had a bit of a dance party. We had a wonderful visit to Madeira and made some lifelong friends. Jenna, Leo, Hazel, and I cannot begin to adequately express our gratitude for the wonderful hospitality this big beautiful family showed us. We’ll be back. Many, many times. Now we are on the northeast corner of the Canaries anchored by a beach in a marine reserve. There are ten other boats here, and I assume they will all be crossing the Atlantic in the next 6 weeks. We also met here the rarest of rare commodities on our extended adventure: an American family with kids out cruising on a catamaran. The boat’ s name is Ventus, the family is from the Midwest, and we all look forward to playing with them for the next few months. We even threw an impromptu dinner party last night with them and a French family boat. It was great to see packs of kids running around Sophie again. So that’s about all for now. We definitely feel like we are back in Adventure Cruise mode, and we definitely still feel lucky. ps … here is a gratuitous photo of a pilot whale playing on our bow.